Industrial Safety Footwear Market size was over USD 5 billion in 2017 and industry expects consumption at over 310 million pairs by 2024. Growing safety requirement for workers in construction and manufacturing sectors should drive industrial safety footwear market size. These shoes provide protection against various hazards including moving machinery, exposure to chemicals, electrical contact and falling objects. These shoes are manufactured in compliance with safety shoe standards including ANSI in the U.S. which may drive the industry growth. Increasing awareness towards health & safety of the labours along with growing industrial mortalities in chemical, construction and other manufacturing sectors owing to lack of protection may drive the industrial safety footwear market growth. These are designed to avert and protect foot fatigue, slip resistance and provide increased support for the arch and heel which are being incorporated in the footwear market, thereby stimulating industry growth. Global leather market was valued at over USD 90 billion in 2017 and is likely to grow over the foreseeable timeframe. Leather is a preferred shoe material for the manufacturing of industrial footwear as they provide stability in the shoes. High quality safety shoes should be leather fine, bright and with no cracks and loose skin. To minimize the risk, proper tanning process should be formulated which may enhance shoes durability, which in turn foster the industrial safety footwear market demand. 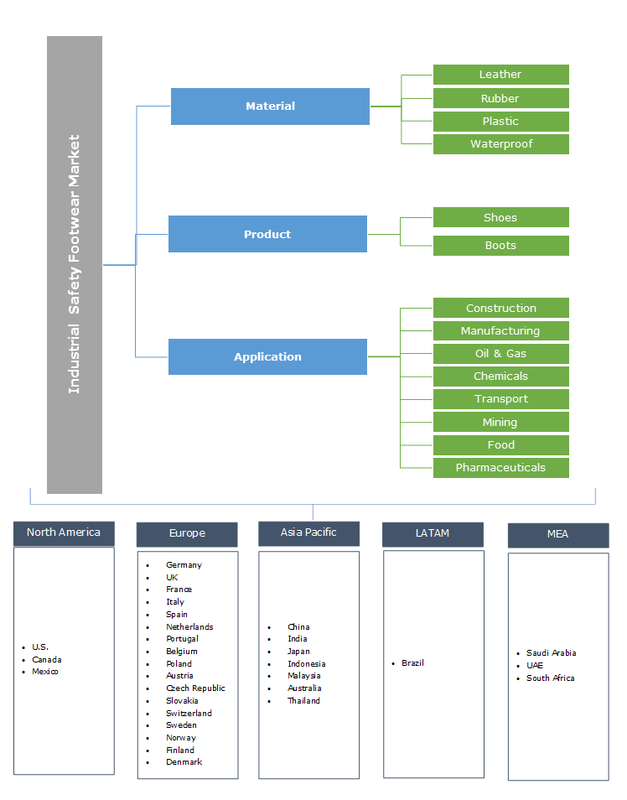 Global rubber market was valued at over USD 25 billion in 2017 and may register close to USD 30 billion by 2024. Shoes with rubber soles are preferred choice in different areas of application where hazardous work is performed. Nitrile rubber soles offers good confrontation against alkalis, acids and chemicals. Moreover, it offers electrical insulation and are majorly used in workplace where protection is required against temperature as high as 300 degree Celsius, thereby driving the industrial safety footwear market growth. Industrial safety footwear is issued by government regulatory bodies which indicates protection and it comes along with a safety symbol printed on shoes. Furthermore, increase in worker safety issues where manufacturers are focused on improving the safety standards should fuel product demand. Leather industrial safety footwear market demand was valued at over USD 4.5 billion in 2017. It is and ideal material for manufacturing work shoes and boots. Various materials are used to make shoes soles depending on the properties needed by the manufacturer, which includes insulation, traction, or durability. These soles have limited usage and are found on higher priced shoes, may stimulate industry growth. Plastic industrial safety footwear market demand may witness average gains at over 2.5% by the end of foreseeable timeframe. Plastic caps are majorly used in boots as they are lighter than metals and allow a metal free shoe to be manufactured which are used in airport industry. These safety shoes use plastic and are preferred to as composite toe caps, which may drive overall product demand. Rubber industrial safety footwear market demand is poised to exceed USD 200 million up to 2024. They safeguard workers from hazards during the work process, generate large deformation and provide high temperature resistance. Properties include durability, grip, elasticity and resistance to extreme temperature which in turn may foster the industry growth. Industrial safety shoes market size should witness gains close to 5% by the end of forecast timeframe. These shoes are shaped to fit the foot with flexible plastic with a heavier material for sole and heel. Moreover, it provides foot protection from day to day activities during the working hours. Industrial safety boots market demand may generate value at over USD 1.4 billion by 2024. These are manufactured from rubber or leather and provide protection against chemicals in the workplace. These boots are manufactured from plastic and other materials which may fuel product demand. Industrial safety footwear market size from construction application may register significant growth at over 4.5% up to 2024. Construction workers should wear safety shoes or boots with puncture-resistant and slip-resistant soles. These shoes require special sole for anti-slip & absorbing shocks which must ensure adhesion on wet, slippery and greasy floors and surfaces to avoid industrial hazard. Industrial safety footwear market demand from oil & gas application was valued at over USD 600 million in 2017. Workers in oil & gas industry are engaged with heavy engineering process such as drilling and require protective footwear to avoid mishaps and hazards. Regulatory framework by OSHA and industry standards which are focused on preventing and identifying exposure to hazards should drive the market demand. Industrial safety footwear market size from mining application may witness gains at over 4.5% by the end of forecasted timeframe. As per OSHA, mining workers should wear safety work shoes or boots with slip-resistant and puncture-resistant soles, to cope up with hazards, thereby driving the market growth. North America driven by Canada and the U.S. industrial safety footwear market size is likely to surpass USD 2.5 billion by 2024. Regulatory framework owing to increasing end-use application demand may drive the regional industry growth. Increasing demand for women safety shoes with stringent laws in the U.S. is likely to drive the market growth in the region. 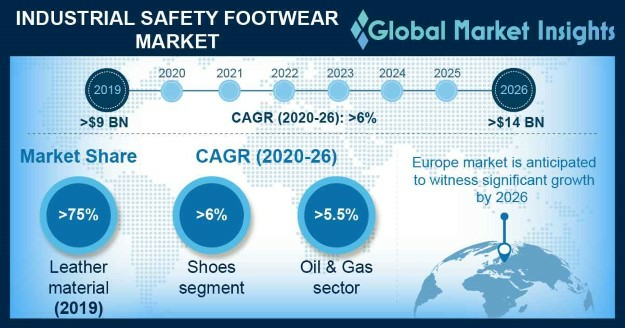 Europe driven by UK, France, Spain and Germany industrial safety footwear market demand is likely to register significant gains at over 4.5% by the projected timeframe. Introduction of occupational safety standards and compliance with strict regulatory mandate for the usage of safety shoes in different industries may drive the regional product demand. Asia Pacific led by, Japan, India and China industrial safety footwear market may exceed a consumption of USD 80 million pairs by 2024. Rapid industrialization along with growing construction, mining, pharmaceutical, and oil & gas industries in the region will drive the market demand. Stringent regulatory norms for workers safety is likely to boost the market in the region. Global industrial footwear market share is competitive on account of manufacturing companies situated globally. Dunlop Boots, Bata Industrials, Honeywell, Uvex Group, Rockfall and WOLVERINE are the key players operating in the industry. The companies are engaged in joint ventures and mergers to expand their product portfolio and strengthen their global presence. The manufacturers are now focusing to produce cost-effective products to foster the overall industry growth. Industrial safety footwear prevents workplace injuries and occupational hazards which includes chemical spill, electrical hazards, contact with sharp objects and wet surfaces. These shoes are fitted with toe caps which are fabricated to protect against impact, compression and puncture which are the most common mechanical types of foot injury. Most of the manufacturers various footwear styles including boots, sandals, and shoes under several brand names. These companies combine quality materials and skilled workmanship globally to produce footwear according to its specifications at both independent manufacturing and company-owned facilities.